Deliciously crispy and flavorful, this main dish is courtesy of Celebrity Nutritionist Christine Avanti. 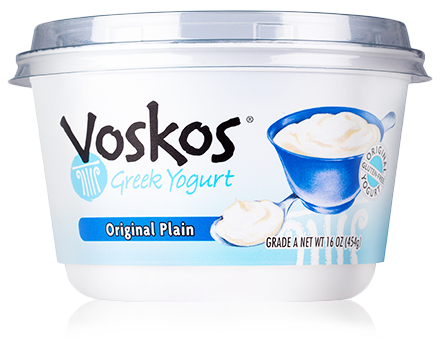 The secret is the sauce its marinated in, made using VOSKOS® Greek Yogurt. You can also use this recipe for a white flaky fish such as halibut or grouper instead of chicken, and if you make a little extra of the yogurt mixture you can serve it as a dipping sauce. Photo courtesy of Anna Ginsberg of Cookie Madness. Pepper both sides of the chicken and set aside. In a bowl, whisk together the yogurt, salt and pepper, ½ teaspoon garlic powder, ½ teaspoon cumin, 1 teaspoon parsley and the juice of half of the lemon. Place the chicken in a re-sealable bag and pour the Greek yogurt mixture on it. Massage the yogurt into the chicken and allow to marinate in the refrigerator for 30 minutes to an hour. In a pie dish, add the whole wheat bread crumbs and remaining garlic powder, parsley, cumin, more salt and pepper and 1 teaspoon of lemon zest. Stir the mixture with a fork to combine. Preheat the oven to 350ºF. When chicken is done marinating, coat one piece at a time into the bread crumb mixture and coat both sides. Repeat until all pieces of chicken are coated in bread crumbs. Preheat a skillet with extra virgin olive oil to medium high and sauté chicken breast on one side. Flip after two minutes or until golden brown crust has formed. Place pan with chicken into the oven to finish the cooking process for 5-10 minutes depending on how thick the chicken is. 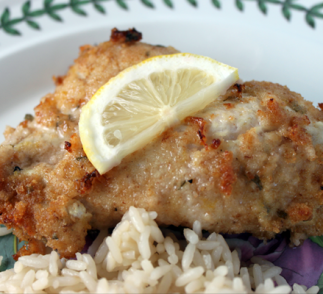 When thoroughly cooked, remove from oven and squeeze the rest of the lemon on top of the warm chicken to serve.